As part of the POPSUGAR Insights "Find Your Happy" study, we asked women if they believed that technology products, such as smart devices and applications, can contribute to making them happy or happier. The results were overwhelmingly positive across nearly all age segments and other segmentations we surveyed. 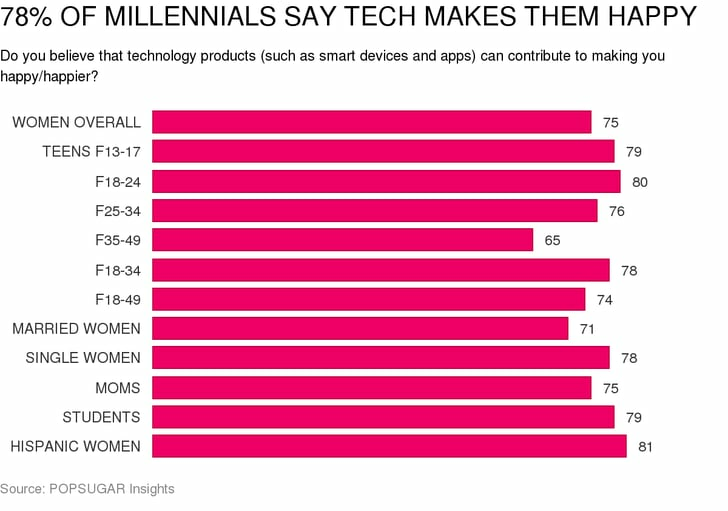 Overall, three out of every four women said that tech makes them happy. Across all age segments, the percentage of women who responded "yes" exceeded at least 74% with the exception of women age 35-49, of whom only 65% said that tech could make them happy. Teen girls (79%) and young millennial women aged 18-24 (80%) were more likely to respond in the affirmative, proving that the future is bright for brands that create smart devices and applications. Among life stages, single women (78%) were more likely than married women (71%) to say that tech makes them happy, while moms (75%) and women without children (75%) were equally likely to believe in tech. Among ethnicities, Hispanic women (81%) were slightly more likely than Caucasian women (78%) to believe that tech makes women happy.